Upon finding out that we were blessed with a daughter with Down syndrome we were told of the many things we should not expect of her. Hopes and dreams seemed to come to a cruel halt before her life began, replaced with worry and fear. What the experts forgot to tell us were the many wonderful things we would have, some gifts far greater than we could ever imagine. If I knew then what I know now, those fears would have melted away, just as our perceived expectations had in the very beginning. 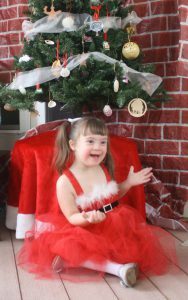 I cannot speak for all parents of children of Down Syndrome, I was only blessed with one. But I think back to those early fears and they seem so minute compared to the many gifts our daughter Kenzie has given us, none greater than the gift of Unconditional Love. The English language does a disservice to the world’s greatest emotion. One word is used for such a wide range of feelings when we profess our love. It can be said that we love a spouse or significant other but not in the same way we love our mothers and fathers. We certainly love our children more so and differently then we do our friends, or a favorite type of food. Some of us love spring time, or our favorite sports team, but so often our love comes with conditions. Spouses divorce, mother and daughter can become estranged. Too much of our favorite food can make us sick or it may be unseasonably cold when spring begins. Though we cringe to admit it most of the love we experience is conditional. When our daughter Kenzie looks me in the eyes, I know I am staring into the face of unconditional love, and I get a feeling too few people on this earth experience. If I am having a bad day, that love remains. If I let her down, I may not forgive myself so easily, but she does. Others may see me as careless or difficult to be around, but she never does. She does not judge me for what I am not, only what I am to her. How can we ever feel defeated, when those you love most will be there no matter what? When Kenzie makes a friend, she doesn’t care about how much money you make or what you can do for her. To receive the greatest love of all, all you have to do is love her back. Your physical appearance is not important to her. She will not look at you differently if you are overweight or if you could afford to put on a few pounds. She doesn’t judge even if everyone else does. What she has taught me is that she isn’t lacking one bit, it is the rest of us that could stand to learn from her. About the Author: Ryan Pickett, and his wife, Tara live in Lincoln, Delaware with their children, Landon (6 years old) and Kenzie (4 years old). They are both special education teachers who are dedicated to education and advocacy for those Down syndrome and their families. Down Syndrome Association of Delaware is a 501(c)(3) non-profit organization whose mission is to be a resource promoting public awareness, education and advocacy supporting individuals with Down syndrome and their families.